This represents the white American vaudeville performer Thomas Dartmouth Rice (1806-1860), as Jim Crow, the character he made famous in 1828 when he introduced it in an intermission of a play called The Rifle by Solon Robinson in Louisville, Kentucky. Rice, born in New York, either based his song and shuffling dance on 'the Jim Crow', which he saw performed on the streets by an elderly disabled African American wearing ragged clothes, or on a song and dance performed by a stablehand in Kentucky. The lyrics and the structure of the song allowed Rice to incorporate local gossip or issues in it, and after each verse and chorus he did the 'Jump Jim Crow' dance. It became such a success that he performed in many parts of America, including Washington in 1833. Jim Crow established Rice as one of the leading entertainers of his era, and he collected and popularised other authentic African American songs and dances. In 1836 Rice toured in England, Scotland and Ireland for a year, and was a huge hit at London's Surrey Theatre. 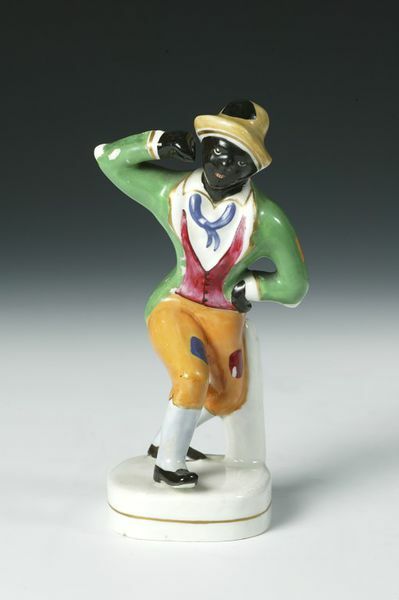 This figurine is modelled after a music sheet illustration for the song 'Jim Crow!' issued after his appearance at the Surrey. Rice went on to incorporate his character into extravaganzas that he wrote including ‘Jim Crow in London’ or ‘Jim Crow in Foreign Service’. Rice is seen as the originator of the blackface minstrel show although he always performed alone and not as part of a troupe. 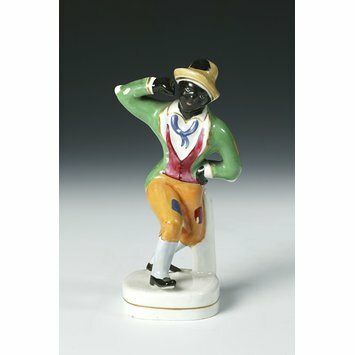 A figure of Jim Crow standing on a circular gilt-lined base, holding his right hand to his head and his left to his hip, wearing a yellow hat, green jacket, maroon waistcoat, white shirt, blue neckchief and mustard-coloured trousers, patched in black. Thomas Dartmouth Rice (1806-1860) performing his 'Jump Jim Crow' song and dance as the character Jim Crow which he first performed in England at the Royal Surrey Theatre, 1836. Staffordshire earthenware, c.1840. Demons of Disorder. Early Blackface Minstrels and their World Dale Cockrell. Cambridge University Press 1997.